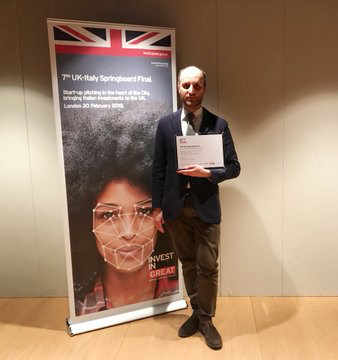 We are honored to announce that we are the winner of the 7th UK-Italy Springboard in collaboration with SETsquared Partnership for our innovative product which will help prevent brain damage. The award gives us the access to their network of competencies to further develop our project and facilitate go to market. We are ready to start this new collaboration, boost our presence in UK and use this GREAT Country as a springboard to grow on the global stage. We would like to thank you the Department for International Trade (DIT), Department for International Trade in Italy, Set Squared, Intesa Sanpaolo, the British Chamber of commerce in Italy, the ITA – Italian Trade Agency, Baglioni Hotels, Copernico, the British Embassy in Italy and all the other partners for making it real. About the UK-Italy Springboard: The UK-Italy Springboard is a business competition open to all innovative Italian startups willing to use the UK as a springboard to grow on the global stage. 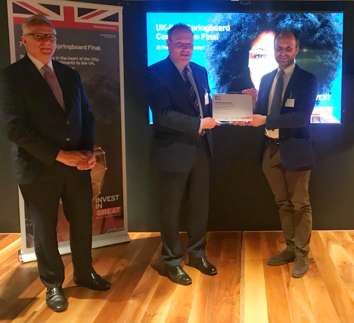 With its dynamic business ecosystem and a strong start-up culture, the UK market offers outstanding opportunities for Italian companies and represents the stepping stone to international markets. The event, organized by the Department for International Trade in collaboration with Intesa Sanpaolo and ITA Italian Trade Agency (ICE), is aimed at international investors, institutions and companies interested in high-potential startups, for investment or business development purposes.